Every year thousands of players play in WSOP events in Vegas in hopes of cashing in on their poker skills (and luck). While calling it a sporting event may be a bit of a stretch, one thing is for sure… there is no shortage of cash at the World Series of Poker. Click Here to See the Full Graphic! With all the developments in online poker recently, it will be interesting to see the turnout at the 2011 WSOP. On April 15th, the US DOJ seized control of Full Tilt Poker and PokerStars’ domain names. The sites eventually reached an agreement for release of their domains, but they were forced to pull out of the US market. Since then, many other domains and bank accounts have been seized by the US DOJ. While online poker’s future remains uncertain, live poker has no choice but to thrive. This year will be a first for the WSOP in terms of coverage. According to ESPN, they will be covering more of the WSOP than ever and even showing poker “live” on a 30 minute delay. This will be much different than the coverage in the past that only showed notable hands. What’s one lesson that we can all learn from Facebook? That people love poker. It may not be what you thought, but it is true. 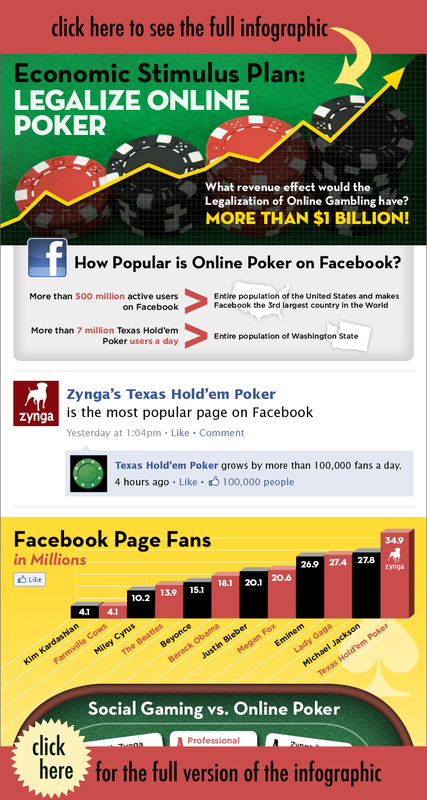 The most popular page on Facebook is not Lady Gaga; it’s not even Farmville…but it is a Zynga game. It’s called Texas Hold ‘Em Poker and 7 million people flock to this page a day to play online poker, for FUN! While many people think of poker as a gambler’s game of luck, it’s simply not the case. Poker is no longer a game just for the wealthiest, the degenerate gambler, or the consummate thief (see our post on poker in the movies if you need examples), it’s become an American pastime. Click to view the Economic Stimulus Plan: Legalize Online Poker infographic. A total of 63,706 entrants vied for millions in prize money in the 2010 World Series of Poker. Professional poker tournaments average more participants than most pro sports events have spectators. The average PGA round only sees about 40,000 spectators, and a US Open match has around 27,733, so it’s amazing to see the number of people who get into poker professionally compared to other sports. Granted, when you were a kid, you probably dreamed of being a professional athlete, not a poker player. Ever-increasing pro sports salaries are quite a draw. But because of this, the quest to gain entry into pro sports is extremely competitive. Even for those who are not the highest paid, sports salaries are enough to make many pro athletes millionaires. There are many shocking discrepancies in pro sports salaries, though, especially between Major League Baseball and MMA Fighting. While pro baseball players enjoy the highest average pay with no enforced salary cap, MMA fighters face the flip side of the coin. Even though MMA generates comparable revenue as the WWE and pro-boxing, MMA fighters are paid far less, although the competition remains very difficult. That’s where poker comes in. A card game that requires skill, but not physical prowess, allows many more people to not only play, but garner a certain amount of fame, as well as a substantial online poker income (bankroll). The game generates some of the highest paying sports salaries in the world. Online poker can be a lucrative career for many. But like any professional sport, it takes a lot of time, practice, and discipline. This graphic shows how online poker income compares to pro sports salaries, and how poker fits into the world of sports. An added bonus—unlike most pro sports salaries, poker has no cap! John Ray over at platykurtosity.com wrote a great analysis in response to this infographic, you can read it here. 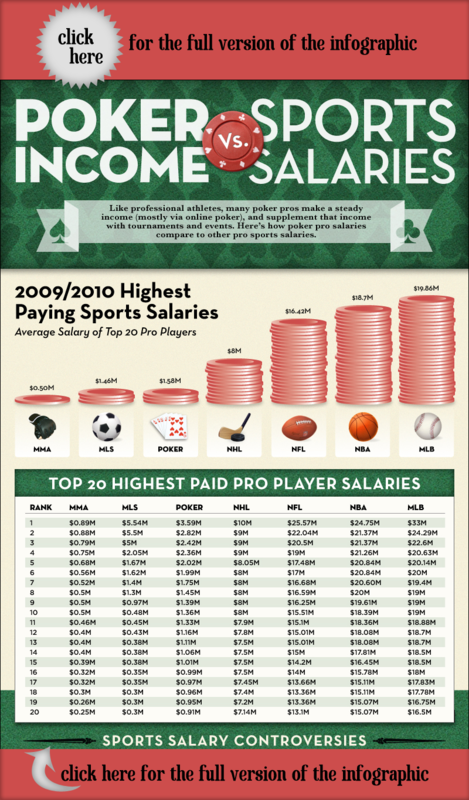 Click to view the Online Poker Income vs Sports Salaries infographic. How to easily navigate the many online poker sites, and manage multiple tables at once. General poker strategy such as table position, variance, betting strategies, and more. How to generate and manage a bankroll. How to control your emotions and stay off tilt, so your playing strategy is not affected. Find out what kind of poker player you are, and what works for you. Once you know this, you can figure out how often and on how many tables at once you must play to reach your income goal. Cases in Sports Marketing, McDonald, Mark A. Jones and Bartlett Publishers. ESPN.com, Does Baseball Need a Salary Cap?